Double X Science: An antibody therapy for hemophilia A? An antibody therapy for hemophilia A? as so many interesting things are. Image credit and license info, via Wikimedia Commons. Last night on TV I caught an ad for Humira, Abbott Laboratories’ prescription medication for a series of conditions including rheumatoid arthritis, psoriatic arthritis, and Crohn’s disease. The ad noted that, like all drugs, this medication actually has two names, its brand name (Humira), and its generic name, adalimumab. That suffix, -mab, indicates that Humira is a monoclonal antibody, a large protein normally produced by your immune system’s B cells to recognize and eliminate proteins and pathogens that are not “self.” In particular, Humira recognizes, binds, and inactivates the protein called “tumor necrosis factor,” or TNF, which is implicated in various autoimmune disorders. There are dozens of monoclonal antibody drugs on the market now, including the breast cancer therapeutic Herceptin (trastuzumab), Remicade (infliximab) for autoimmune disorders, and Rituxan (rituximab) for non-Hodgkin lymphoma. (*) In most cases, by binding specific proteins, either in solution or on cell surfaces, these molecules either inactivate proteins (as in the case of TNF), target the cell for death, or block inappropriate cell signaling (as in Herceptin). Other antibody designs use the antibody as a "guided missile," targeting drug or radioisotope "warheads" to cancerous cells. 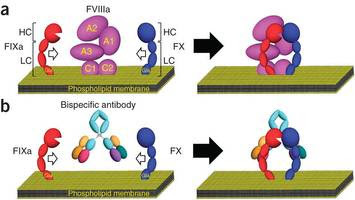 On Sept. 30, though, a team of Japanese researchers at Chugai Pharmaceutical, reported an example of a new kind of antibody application, and it’s pretty slick. The paper concerns a novel treatment concept for hemophila A, an X-linked recessive bleeding disorder that affects about 1 in 10,000 men. It is caused by a lack of a clotting protein called factor VIII (FVIII), and the typical treatment is “prophylactic supplementation” of the missing protein. There are three problems with that treatment, as the paper notes. First, FVIII is expensive. It also must be administered frequently and intravenously, which is especially difficult for pediatric patients and “negatively affects both the implementation of and adherence to the supplementation routine.” But perhaps most significantly, in about 30% of cases the body recognizes the recombinant FVIII as “non-self” or “foreign,” and develops antibodies (“inhibitors”) to inactivate it, rendering the treatment ineffective. To circumvent that problem, the Chugai team developed what is called a “bispecific antibody” to replace FVIII. So what is a bispecific antibody? 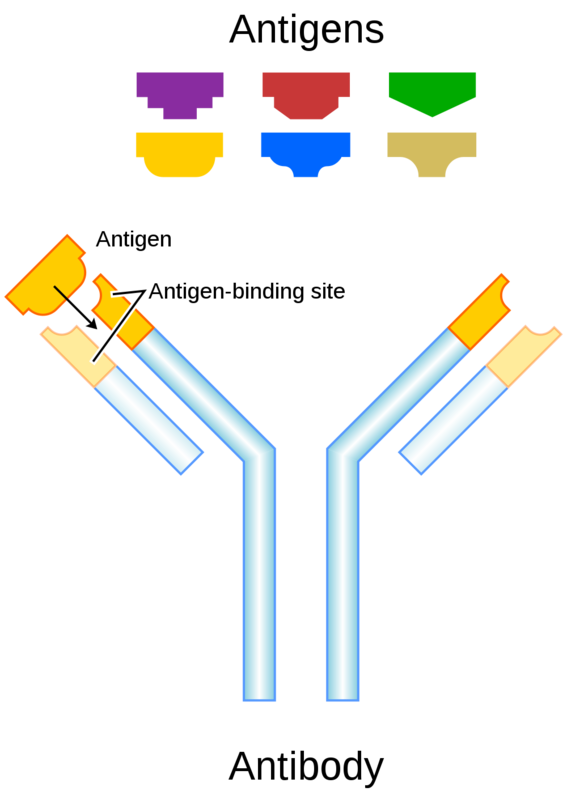 In cartoon form, antibodies resemble the letter Y, with antigen-binding regions at the tip of either branch. In a normal antibody, those two binding regions are identical, such that each antibody can bind two copies of the same protein molecule. A standard monoclonal antibody has two binding arms, each recognizing the same antigen (protein target). A bispecific antibody, though, has two different binding domains, one for each of two proteins, such that it can effectively act as a scaffold to bring two proteins – or the cells they are attached to – together. The only bispecific currently on the market, Trion Pharma’s Removab, acts to couple immune system T cells and macrophages to tumors. A bispecific antibody, Trion's Removab. Chugai’s scientists developed a bispecific antibody that does something different. Their antibody, called hBS23, links two other clotting factors, FIXa and FX, thereby mimicking the function and architecture of the missing FVIII without actually administering it. FVIII activates FX in the presence of FIXa. hBS23 is a bispecific antibody that replaces FVIII. In test tube clotting assays, hBS23 was about 14-times less catalytically efficient than FVIII itself, yet could nevertheless induce clotting, even in cases where the plasma contained inhibitors against FVIII. (Recombinant human FVIII had no effect in those latter cases.) In a non-human primate model of hemophilia A, hBS23 prevented development of anemia and reduced internal bleeding comparable to FVIII itself. Significantly, hBS23 lasts a long time in the primate bloodstream – with an IV half-life of 14 days and comparable subcutaneously bioavailability – yet seems unlikely to elicit inhibitory antibodies of its own. That subcutaneous activity is significant, as regular subcu administration should be more easily tolerated than an IV. Based on the these studies, and some simulations, the authors predict that "once weekly dosing of 1 mg per kg body weight of hBS23 would show a continuous hemostatic effect in humans." For more details, you can read the report here. We've also got a partner post for you, an antibody explainer by our very own Jeanne Garbarino. Be sure to check it out! *Fun fact: If you’ve ever wondered about how drugs get their generic names, they are conferred by the US Adopted Names Council. The names have a kind of prefix/stem structure, linking a manufacturer-supplied but meaningless prefix (adalimu–) with a specific stem (eg, –mab) that denotes the drug class or activity. There are literally hundreds of stems, including –coxib (COX2 inhibitors), –vir (antivirals), and –stat (enzyme inhibitors); for a complete list, click here. Frankenstorm: What is the role of climate change? Xplainer: How do you date a pregnancy? How helpful are dense-breast right-to-know laws?